We are pleased to introduce the newest addition to the series of Custom Oil Colors: Sunset Orange! Sunset Orange was manufactured by Gamblin Artist Colors specifically for Pygmalion’s Art Supplies in Indiana, in partnership with Wet Paint. Designed by Indiana artist Mark Blaney, and formulated by Gamblin, Sunset Orange is a unique mixture of two modern pigments* and titanium white for a bright, semi-transparent orange. Sunset Orange is available in 37ml tubes for only $8.95! This is a limited edition and available while supplies last. As with the past Custom Colors (like last year’s Knew Black), all proceeds from Wet Paint’s sales of Sunset Orange tubes and merchandise benefit a local non-profit organization. This year’s recipient will be Feline Rescue in St. Paul. Just arrived! Sunset Orange t-shirts are also for sale. Categories: In depth with Darin, News, This just in! New products we are excited about | Tags: custom product, Feline Rescue, Gamblin, Pygmalion's Art Supplies, Sunset Orange, Wet Paint St. Paul | Permalink. This blog post is written by Virginia, the Programming Manager at Wet Paint. Having planted the garden and tended to its growth along the way, now comes the harvests’ bounty. And we have a bountiful season of creative opportunities for you to sample. New varieties abound! – from the satisfaction of making stunning Crepe Paper Sunflowers and jewel toned French Lace handbound Journals, from the deeper dives of Self Portraits 3 Ways and Experimental Drawing, to the rich exploration of creative life questions such as “Who Am I Now?” Organizational Journaling for Pre and Post retirement. There’s a whole new crop of classes designed for the absolute beginner who wants to try painting and drawing with themes like painting pets, miniature landscapes, painting in the style of Monet, Matisse and more! Perennial favorites form the base of any excellent feast! You’ll find fresh and fortifying classes by top-notch teaching artists in watercolor, acrylic painting, encaustic painting, drawing, book binding, rosemaling and hand lettering…including a new Monthly lettering practice Meet-up on the first Monday of the month. Bright notes and deep flavors round out the season! Look for show-stopping classes and demos by visiting artists in sketching, relief printmaking and silkscreen printing as well as other great demos and hands-on events that will surprise, engage, edify and cultivate your creative life. To see the full bounty, head on over to our events page to browse the whole lineup! Categories: Events at Wet Paint, News | Tags: acrylic paint, Classes, creativity, drawing, events, landscape, pet portraits, plein air painting, self portraits, watercolor, Wet Paint, Wet Paint St. Paul | Permalink. Portable, Practical, and Always Unique: The 2018 Wet Paint Schmincke set is on its way! Just in time for World Watercolor Month in July, and the travel & outdoor activities that come with the warmer summer months, we’re pleased to announce the imminent arrival of our 2018 custom Schmincke Horadam ½ pan watercolor set. As with previous sets, the 2018 version features 12 moist, professional-grade colors in a Schmincke tin, plus room for adding more…but that’s where the similarities end! Our new set is an exciting partnership with Jennifer McLean, watercolor & mixed media artist, and blogger at justaddwatersilly.com and doodlewash.com. Jenn got her first Horadam ½ pan set from Wet Paint in 2013 and has been a fan ever since: “Schmincke has some wonderfully unique watercolors that I cannot get anywhere else and since this palette is such a fantastic deal, I’ve always supported Wet Paint every time there was a new palette out. To think you get a quality tin and twelve half pans which should cost over two hundred dollars.” As a great supporter of Wet Paint and our custom palette Horadam sets, asking Jenn to choose the colors for our 2018 tin was a no-brainer. Her choices – radiant, transparent warm & cool primaries, plus two favorite semi-opaque colors – make this selection the brightest, cleanest mixing palette we’ve offered. Check out the color chart below, then go to her blog to read Jenn’s account of her color picking process. When you visit her blog, you will also find Jenn’s recommendations for additional colors to supplement your new set, as well as information about entering an exclusive giveaway! Another major difference between the 2018 set and prior incarnations is the tin. We’ve skipped the 18 ½ pan square format tin this time and instead packed Jenn’s 12 colors in a long, narrow tin that accommodates 24 ½ pans and a full size brush. Best of all, this tin has a brilliant, full color watercolor graphic on its cover (and the Schmincke owl logo, of course!). Beautiful! If you’re new to Schmincke’s Horadam ½ pan watercolors, you need to know that all 139 colors are filled a quarter at a time to insure the greatest consistency & immediacy available in a “dry” watercolor. Also unique, the formulation for Schmincke’s tube color is exactly the same as that for their pan color, making it easy to go between tubes in the studio and pans en plein air. We have confirmed shipment from Germany, and expect our sets to arrive in Saint Paul in late June. If you want to be among the first to get the 2018 set, we are now taking pre-orders. We will not be making changes or substitutions to the colors in the new set. We anticipate a heavy influx of orders for this set – they will be processed in the sequence they are received. Order fulfillment may be longer than usual due to volume, once they arrive. The other exciting news from Schmincke-land is our Semi-Precious Stone 3 Tube set. This special edition set of 5ml watercolors features historical earth tones that are well suited for outdoor and nature painting (and are a fun addition to a springtime sketching session). Lapis Lazuli, Red Opalite, and Green Porphyry stones have been specially milled to create semi-opaque pigments. These granulating colors have subtle tints and are incredibly lightfast. While not strong mixers, we have found that combining them in a wash with a tiny bit of modern pigment such as Pyrrole Red or Hansa Yellow has produced some great two-toned effects where the larger particles add great texture, even on smoother finish papers. As with any particularly heavy pigment, these stone-derived colors may settle in the tube somewhat. If this occurs, we recommend mixing the pigment back into the binder (stirring in the tube with a long pin or needle tool) before use. These are a limited edition only available in 5ml tubes and will not be added to the standard Schmincke color selection. If you want to create tactile and visually unique pieces in miniature, then new-at-Wet Paint Hahnemühle watercolor postcards are the perfect choice! The round-edged, cold pressed postcards, with the address field printed on the back, are perfect for on-the-go creative souls, from watercolor and plein air painters to urban sketch artists. The 30 cards have a weight of 230 gsm and can be safely transported in the stylish metal box, to be painted and then posted wherever you are. Holiday greetings, a travel portfolio, a picture story…there’s no limit to the possibilities. The softly textured paper allows for easy use of brushes and every kind of pencil or pen, while the card’s natural tone allows the colors to glow. Hahnemühle’s Watercolour Book is the ideal companion for urban sketchers or artists on the go. The natural white, alpha cellulose 200gsm acid free paper features a fine grained surface structure on both sides, making it ideal for creating full width panoramic paintings. With 60 pages / 30 sheets, the Watercolour Book is compact while offering an ample number of pages for painting your memories on. Watercolour Books feature a handsome, durable cover and a rubber band to hold the cover together to protect your artwork. Available in the landscape formats A6, A5 and A4 and portrait format A6 and A5…click here for more info! FM Brush’s Faux Kolinsky and Faux Squirrel – two of our most popular watercolor brushes – are on a great promotion this summer: buy any three (of any combination) Faux Kolinsky or Faux Squirrel brushes at 25% off and get a ½” Faux Squirrel “Whale Tail” brush FREE! FM Brush Company has developed a proprietary blend of Techno-Synthetics that recreate all the attributes of natural hair brushes, but as a socially responsible alternative to animal hair. The Faux Kolinsky series mimics the elusive natural tip of a Kolinsky brush. It’s generous reservoir yields unmatched performance. The brushes are elegant with a cupro-nickel ferrule and long satin black albata handle. Faux Squirrel brushes are made of synthetic fibers that hold as much paint as a natural squirrel brush, allowing for a generous, even flow of paint…while retaining their shape and durability better than their natural-filament counterparts. Faux Squirrel’s seamless crimped nickel-plated ferrules and innovative soft coated handle allow for a sure grip through hours of painting. Made by FM Brush and completely assembled in America. Da Vinci Brush’s Casaneo Series brushes are coming soon to Wet Paint. We’ll be stocking these thirsty, synthetic squirrel brushes in a classic quill and a travel brush. All the precision of your favorite synthetic, with the release of color usually associated with a natural hair. It’s watercolor season! Ready or not, Wet Paint has got you covered! Categories: In depth with Darin, News, This just in! New products we are excited about | Tags: DaVinci Brushes, FM Brush, hahnemuhle, Jennifer McLean, Schmincke, Schmincke half-pan watercolor set, Schmincke Horadam, watercolor set, Wet Paint, Wet Paint St. Paul | Permalink. Down pace your life to something more relaxed and curious. Summer classes at Wet Paint offer you ways to refresh your creative spirit, support for your continuing creative pursuits or perhaps explore new materials or techniques for the first time. You’ll find many more single session classes along with a handful of shorter multi session classes ranging from lettering and book + paper arts, to printmaking, painting and drawing and some unique specialty classes. When the Work Doesn’t Flow taught by Ellie Kingsbury addresses those dry spells artists inevitably experience and how to work with them; Intro to Micrography taught by Kyna Levi (also offered for young artists); Intro to Screen Printing taught by Tim Cronin and Jeff Hnilicka. They are also teaching a Summer Printmaking Sampler for ages 10-15; Floral Abstractions: Onsite Sketching to Finished Painting taught by Paige Tighe; Intro to Calligraphy classes for young artists and families taught by Mary McKee; plus 2 classes in the works: Wet Paint Watercolor Paper Sampler Exploration class and How to Paint Dew Drops in Watercolor taught by Illinois Watercolorist Jane Mason of Watching Paint Dry. Many returning instructors are offering new classes such as Custom Playing Cards and Tarot Cards taught by Jeff Nelson who has three offerings in August; A whole series of new Artists Way classes taught by Tara Tieso including Abstract Urban Sketchbook, a Mixed Media Triptych and Artists Way Mini Retreat; Painterly Drawing: Water soluble Colored Pencils taught by Monica Fogg; Os Style Rosemaling taught by Julie Anderson (pictured); Watercolor + Pastel Workshop and Watercolor/Gouache/mixed Media Plein Air Workshop taught by Carl Oltvedt; Drawing Pet Portraits in Pastel Pencil taught by Susan Beck, A whole slew of classes taught by Liz Carlson including Mail Art-A-Go-Go and Cut + Paste Illustration; plus two new offerings from Bridget O’Malley Handbound Book: Japanese Side Stab Binding, and Holding it All Together : Longstitch Binding with Cave Paper. Monthly Sunday Sketch-In’s, Andy Evansen Watercolor Demo in July, Bullet Journal Meet-Up in August, and our Annual Summer Postcard Project all summer long! Keep an eye out for more events and classes in the works on our Facebook page, website or in-store posters. Grand Old Day Master Artwork Selfie Station, Pinners Conference and Expo in Minneapolis, Monthly Artist Talks at Lyngblomsten, Lyngblomsten Mid-Summer Festival, American Swedish Institute’s Great Makers Exchange, Pet Portraits during Paws on Grand. With 50+ classes and events, it’s going to be a lot of fun in the classroom and we hope to see you there! Categories: Events at Wet Paint, News | Tags: Adult and Children's Art Classes, Classes, events, Virginia McBride, Wet Paint, Wet Paint St. Paul | Permalink. There’s no limit to how many postcards you can send, but in order to participate, postcards have to arrive at Wet Paint via our friendly postal carrier – – no dropping them off at the store! Don’t forget to sign your postcard(s) and let us know how to reach you. We want to make sure we’re crediting you when we post the work online and we want to be able to contact you with details about the end of summer art opening on August 17th, 2018. -In order to have your postcard displayed in our end of summer exhibition, you’ll need to have it postmarked by August 13th, 2018. 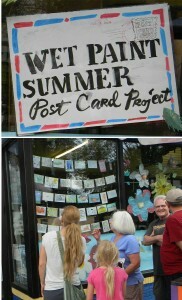 Categories: Events at Wet Paint, News | Tags: events, mail art, Postcard Project, postcards, Wet Paint St. Paul | Permalink. It hardly gets more classic than Manuscript’s “1856” resin barreled fountain pens. The translucent resin almost seems to glow from inside, with pattern and light ebbing & flowing as the pen moves. The medium-sized, steel handwriting nib glides smoothly over the page, applying ink from either a universal cartridge or a converter (both included). We brought in our three favorite colors: “Northern Lights” – a deep pearlescent blue with yellow marbled stripes…it reminded us of the Wet Paint colors; “Red Storm” – a fiery red with swirling white patterns; and “Oyster Mist” – a handsome ivory colored pen with striations that look like a museum-quality geological discovery. The person that gets one of these is gonna smile every time they use their pen! Each 1856 comes packaged in a gift box. And – did I mention they’re on sale? If the “1856” is a little too formal, may I suggest Caran d’Ache’s “849 Series” metal barreled fountain pens? The bold, rounded-edge hexagonal barrels are made of aluminum…they look heavier than they actually are. Both the barrel and the stainless steel nib are super durable; the pens boast a lifetime warranty for a reason! The calling card of the “849,” though, is the barrel colors: a range of “can’t miss ‘em” fluorescents; sleek, glossy, contemporary white; and matte, industrial-looking black or blue. The decision to get one is easy, deciding which one to get is the hard part. To make it easier, they’re on sale – so you can get more than one. Blackwing Pencils continue to be hugely popular at Wet Paint. The smooth, dark graphite lines…the distinctive square ferrule that holds the distinctive (and refillable!) square eraser…the unique, “blink & you’ll miss them” limited edition themed pencils…dreamy! With this in mind, we brought in two great gift ideas for the Blackwing enthusiast: the Pencil Roll and the Desk Set. The former is a durable, waxed canvas roll that comes with five pencils and has space for a pad and a sharpener (not included). (Speaking of pads…we just received some brand new blank and dot grid books from Blackwing…just sayin’.) The Desk Set comes with eight of each “standard style” Blackwing pencil – 24 pencils in all – plus a coveted long-point sharpener. This bounty is packaged in the most handsome pear wood box that you’ve ever seen. Wow, would that box look nice on somebody’s desk. Lamy Gift Sets aren’t in the catalog…but they’re a super good deal, so I will tell you about them. These sets pair a dashing Filofax notebook with a Lamy fountain pen: choose a red notebook with White Safari (extra fine nib); a magenta notebook with a Black Purple Safari (fine nib); or a lime green notebook with a super rare Charged Green Al Star (extra fine nib). They’re already in a box appropriate for gifting…your work is done! Oh, look at that: it’s Herbin’s new “1798” Amethyste De L’Oural ink…right on cue! This deep, rich purple ink has an appealing silvery lustre…perfect for shimmery, hand-lettered highlights or penning your Minnesota Vikings dream season remembrances. “Amethyste” is the first in a series of new ink colors that will make up the Jacques Herbin 1798 Collection…get in at the beginning! The jars themselves are as beautiful as the ink. Categories: In depth with Darin, This just in! New products we are excited about | Tags: Caran d'Ache, fine writing, J. Herbin Ink, Lamy, Manuscript, Palomino Blackwing, Wet Paint St. Paul | Permalink. I am writing to share my top picks for art inspired gift giving for kids. I am a local artist, author and illustrator- but more importantly, I am a mother of 3 children- ages 9, 7, and 5. I have a background in early childhood education, and many, many years of teaching, creating and making joyful messes with children. I am frequently asked what I would suggest purchasing for kids to encourage creation and inspire creativity. One of my biggest pieces of advice is to get children REAL art supplies. Yes, they are a bit more money, but I have seen firsthand the difference in quality of art and love of making when children are given higher quality art supplies. Skip the big box sets of “100 ITEMS!” – most of which are lost, broken, dried out and faded within hours of opening. Instead, opt in for a few simple, but vibrant supplies, that are sure to make satisfying and stunning pieces of art. I am fiercely devoted to shopping at Wet Paint for materials, because the selection, vibe, and staff are beyond excellent. These guys are nice, heavy paper for any kind of drawing, bound like a book, and a full 288 pages! We keep a couple in the car for drawing when “bored”, my kids travel with them, and have one next to their bed for late night drawing. I love that they’re bound, because it allows a collection of art (288 pages!) to be saved easily. These bright solid paint sticks are my most recommended to parents who are looking to get something new and interesting. They are capped like a marker, but smooth like a paint. They are deeply satisfying to draw with, almost like a lipstick. They dry fast, are not very messy, and come in varieties like metallic and textile. I think kids as young 3 and as old as me would enjoy these! Yarka’s palettes are semi-moist, vibrant watercolors. These are SOOOO much better than those dried out, barely there color, other brand watercolor paint palettes we all used in school. Creamier and brighter, kids love painting with these. I especially love watercolors with kids if the paper is wet from a spray bottle or big brush. Watching the colors swirl and mix is so much fun process, and if you use a decent watercolor paper, the images can be saved for gift wrapping, card making, and other fun crafts. A step up, for my kids, is a tube or liquid watercolor. The Niji brand is affordable, and kids love to squeeze a bit of paint onto a palette and mix it up with water. It’s also great for learning how to color mix and creating unique shades. Wet Paint also carries two other already mixed liquid watercolors, which are also fantastic. I like the Strathmore vision watercolor pad. It isn’t top shelf paper, but it is a million times better than flimsy kid craft paper. You get 30 sheets for $10, and end up with frame-able kid art and great watercolor abstracts for various paper projects. One of my personal favorite art supplies, I use these crayons for almost all of my base sketches, and my children use them whenever they color. I think they are brighter and smoother than a typical crayon, and they are amazing with watercolors or inks as a resist. Plus, beeswax is a natural and renewable resource, unlike petroleum-based paraffin of other crayons. I have used art panels in many of the classes I’ve taught to young artists. I always ask them, “how do you like painting on the panels?” And everytime they all say IT IS SO MUCH FUN. The Ampersand art panels come in many finishes, and I love them all. My favorites are basswood and claybord, but you really can’t go wrong with any of them. They are smooth, sturdy, and hold endless amount of material (so they’ll never get soggy like paper, no matter how much paint your kids pile on). Kids feel VERY proud of art made on these panels, because they are instantly ready to gallery hang, which makes any artist feel legit. Pretty clay in fun packs of four colors, and it never dries out. Unlike other clays, it isn’t crumbly, and so less messy and easier to clean up. Soft and smooth clay is easier to create detail work, and to sculpt into the perfect figure. I suggest getting a lidded plastic pan/tray, that the clay can be kept in. Then it is easier to tidy up, and keeps it all in one spot. Bonus- add a couple IWAKO Japanese mini animal erasers to your clay tray. My kids love to sculpt tiny furniture and gardens and lands in the tray for the eraser guys to live in. Tiny clay bunkbed with a tiny eraser bunny = CUTE. Somewhere between Playcolor and watercolors, is the new Marabu Art Crayons. Silky and satisfying like Playcolor, they are a joy to draw with. But add in a paint brush and cup of water, and they turn to pretty washes and blends. These come in sets, or a la carte, for the perfect set of favorite colors. Yupo is fun paper to play with and experiment new techniques on. I can’t imagine any child wouldn’t love it! It is silky smooth and lush, and with ink or markers is complete joy. Our kids love to use the Sakura Gelly Roll pens on it, or the Touch brush markers. The markers just saturate the paper with color, and the gelly rolls are glossy and glittery. My favorite pen, for drawing, sketching and writing. We can’t keep enough of these in our house. Everyone loves them. Solid black, smooth, felt tip, they are great for outlines and detailed drawing work. Now that you have all the supplies, make sure you grab a $3 cigar box. Cigar boxes are the best! When I was kid I kept all my crayons in my grandpa’s old cigar boxes, and so it is nostalgic for me. But besides that, they are appealing to look at, practical for storage, stackable, sturdy, and a great size for almost anything. Categories: News, This just in! New products we are excited about | Tags: Ampersand panels, Ara Elizabeth Schmidt, Cigar Box, Claytoon, creativity, Faber-Castell, kid's art, Kuretake Bimoji Pen, Marabu Art Crayons, Molotow paint markers, Niji Watercolor, Pentalic Utility Sketch, Playcolor, Wet Paint St. Paul, Yarka watercolor, young artist, Yupo Paper | Permalink.